AllegroMedical.com presents The Air Filters, Pack of 10 for VacuMax™ Suction Machines. 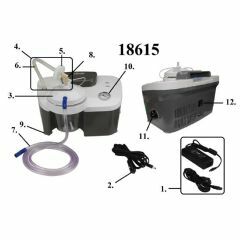 Works with VacuMax™ Plus and VacuMax™ Go Suction Machines model numbers 18615 and 18610. Please call our customer service department for pricing on other parts pictured.